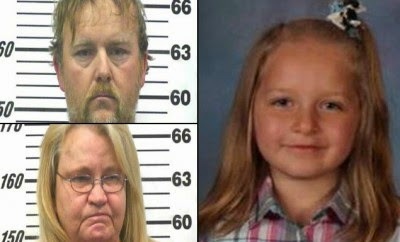 Randall Vaughn, 42, and Mary Vaughn, 59, pleaded guilty to second-degree murder and aggravated child neglect and were sentenced to 35 years in prison on Monday in Rogersville, Tennessee. The cruel couple forced a five-year-old girl to drink so much soda and water that her brain swelled and she died. The Vaughns – the father and stepmother of Alexa Linboom – made the schoolgirl down more than half a gallon of grape soda and water in just two hours. It was a punishment after the couple found the girl drinking a soda that they said was reserved for adults. Mirror UK reports that District Attorney General Dan Armstrong said that Alexa's brain swelled as a result of drinking so much liquid in such a short space of time. Although Alexa screamed in pain and fell unconscious, the couple did not take her to hospital for hours on January 1, 2012, reports the New York Daily News. She was eventually taken to a hospital in Johnson City, Tennessee, where she died two days later. Alexa's four siblings - aged seven to 16 - have been placed in foster care, authorities said. Dan Armstrong said: "He's in his early 40s and she's in her 50s, so I don't think either one of them will ever get out. We believe it's an effective life sentence."